We are an independent kitchen specialist which means that we can offer you a huge range of kitchens with endless style and budget options, from cool and contemporary to classic Shaker looks. Whatever style you decide upon our planning and design skills will help you to create your perfect kitchen. Visit our kitchen studio, and we will be happy to talk to you in more detail about the service we offer, your exacting needs and your budget. We can advise you on every aspect of your new kitchen, from design to installation and all things in between – including sinks, worktops, lighting and electrical appliances. How your kitchen works is as important as how it looks. Whether you love entertaining, have children to cook for or simply want to fix up an easy meal, we’ll create a kitchen that suits your lifestyle perfectly. Once you’ve decided on your budget & style of kitchen, the next step is to find out the exact measurements of your kitchen. This will require an informal visit by us to your home which is completely free of charge. We will measure your room, and discuss your ideas and requirements. We can then work through all the design elements to create a room that suits your needs, makes the best use of the available space, and works within your budget. Once we have created a detailed 3 dimensional plan of your new room we will invite you to Hub Kitchen Design Studio in Cleveleys to view the virtual plans and discuss costs in detail. We are pleased to offer an out of hours and weekend appointment service for customers unable to visit us during usual opening hours. Any changes you wish to make to the design are considered in detail, and amendments are made so that you can view the changes before making your final decision. Once you’ve accepted the estimate and we’ve arranged an installation date, our team will remove your old kitchen and fit the new one. All plumbing, electrical and gas connections are carried out by fully qualified expert tradesmen. Any additional works for example flooring including under floor heating, wall removal/construction and window alterations can all be done as part of your installation which can be fully project managed by us. No project is too large or too small for us to consider. 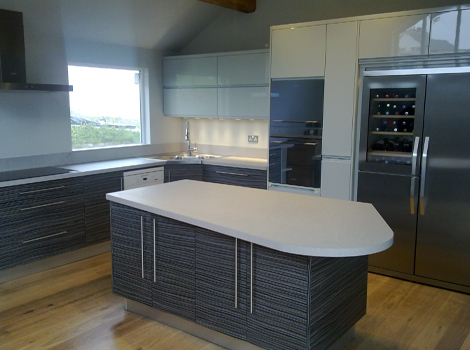 Our fitting team have worked together for over 20 years and have vast experience in kitchen installations. Every kitchen unit is delivered fully constructed to your room specifications and our installation equipment is especially sourced to enable the best finish possible. In addition to a vast choice of external cupboard door finishes, there are also many options available for the interior colour of your units which will maximise the appeal of the completed kitchen. These finishing details can massively enhance the look and feel of your kitchen, creating a stylish and high end appearance. Soft-close drawers and doors come as standard, and drawers extend fully for easy access. Drawer and door fronts are detachable for cleaning, and all our kitchens use the latest internal accessories to allow flexibility and ensure that space is used to its maximum. Once the kitchen has been fully fitted and any final work has been completed, we will carry out one last inspection and sign off with you and confirm that you are delighted with your finished kitchen.